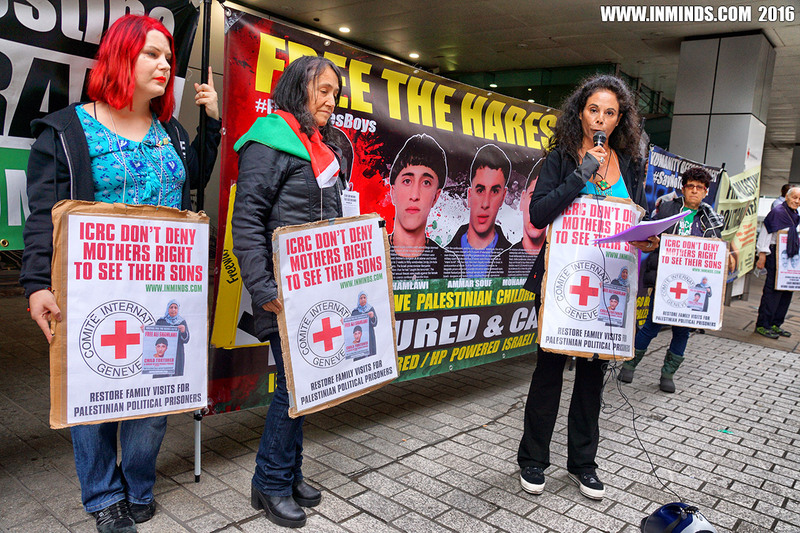 On Friday 16th September 2016 Inminds human rights group protested for a second time outside the UK Mission of the International Committee of the Red Cross(ICRC) in London to demand it restore the twice-monthly family visits for Palestinian political prisoners and for the ICRC to fulfil its duty towards Palestinian prisoners in ensuring the Fourth Geneva Convention is respected by Israel. 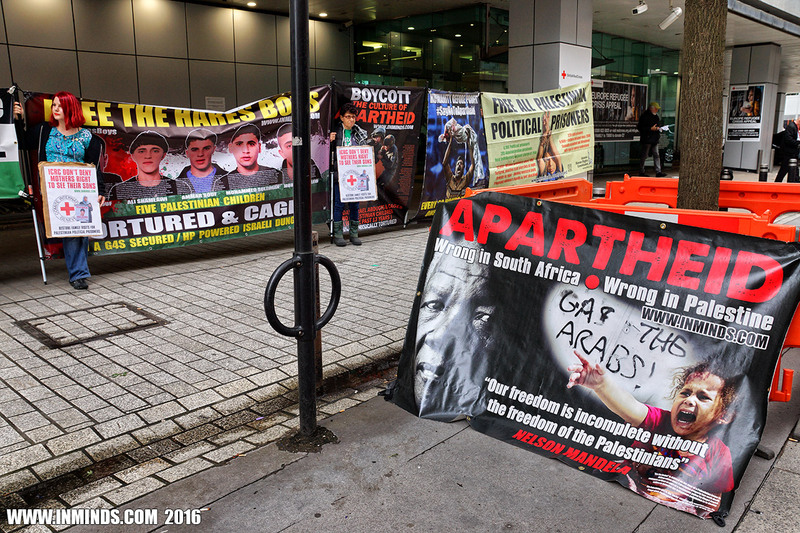 Despite a tube strike and weather warnings of thunderstorms a modest contingent of activists still managed to attend the protest. 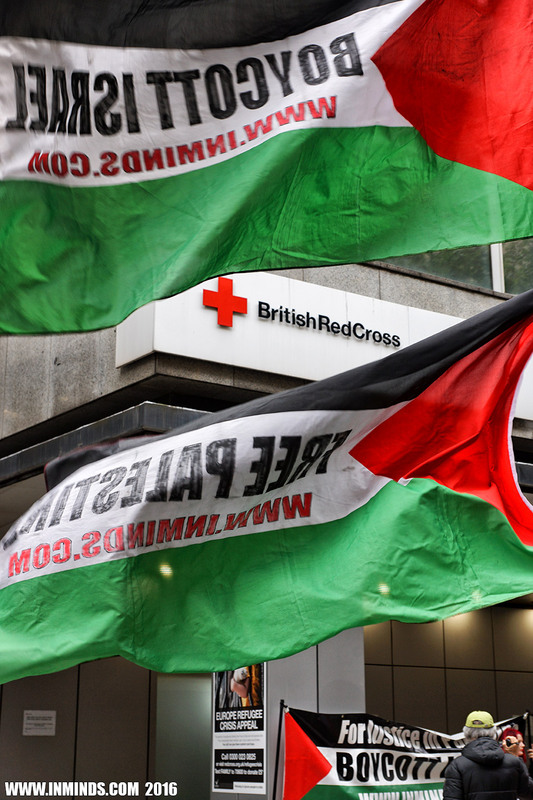 The public were at first surprised when they saw the protest and asked if we were protesting in support or against the Red Cross, when we explained the sorry situation they were shocked at what the ICRC was doing in Palestine, some wanted to give us donations to show their support. 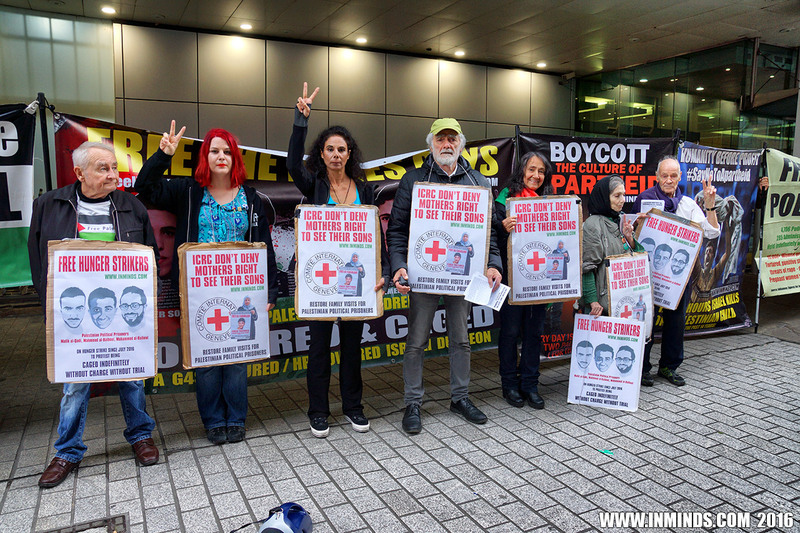 Many members of the Red Cross came out to see the protest, all were very sympathetic with one African member saying in solidarity "we are all Palestinians". 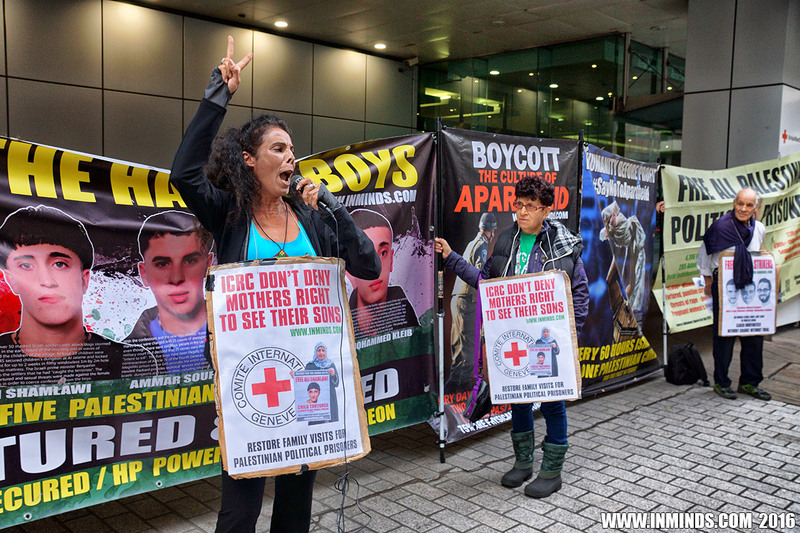 Mona Sadek, the deputy head of mission for the International Committee of the Red Cross in the UK, came out and asked if we had encountered any difficulties outside their building after witnessing the police lead a zionist trouble maker away after he had abused some of our protestors. We must mention that we were fortunate to get good policing on the day with an experienced policeman that respected our right to protest and the right of others to disagree with the protest, stepping in only when people crossed the line. Mona Sadek invited us inside for a meeting where we discussed the latest developments to what had happened to Ali Shamlawi's parents and the other parents who had been thrown off an ICRC coach in front of ICRC officials, and the total lack of movement by the ICRC in restoring twice monthly visits for male Palestinian prisoners from the West Bank. Unfortunately she had not been debriefed by the ICRC office in Palestine and so was not aware of what had happened to the parents at Tulkarm checkpoint or of any further developments regarding visits. 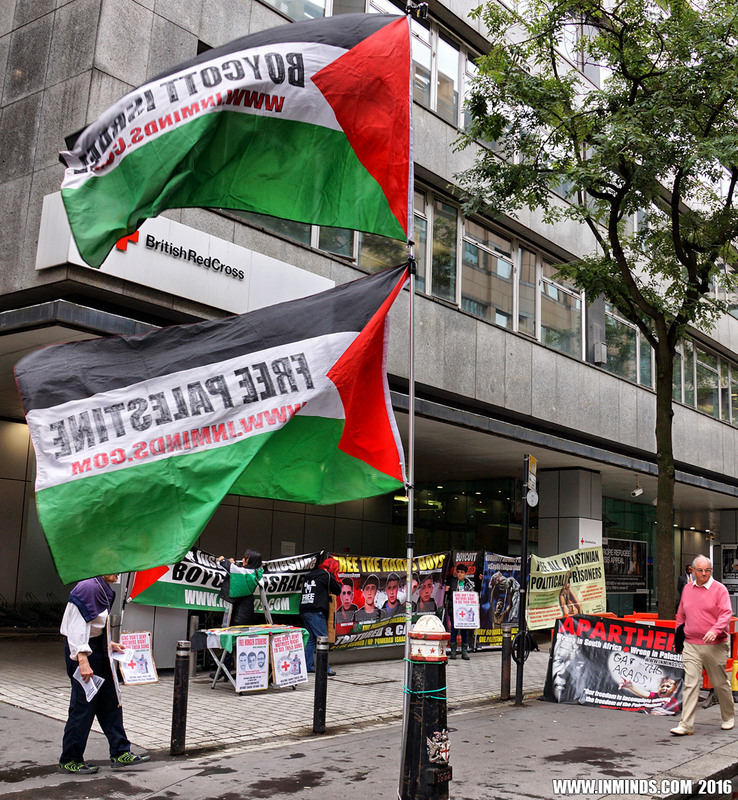 She felt she could not directly respond to these issues as it was outside of her territory but promised to raise the issues with their Palestine office and that a reply would be sent to us within a week, apologising that we had not received any written reply to our previous letter. 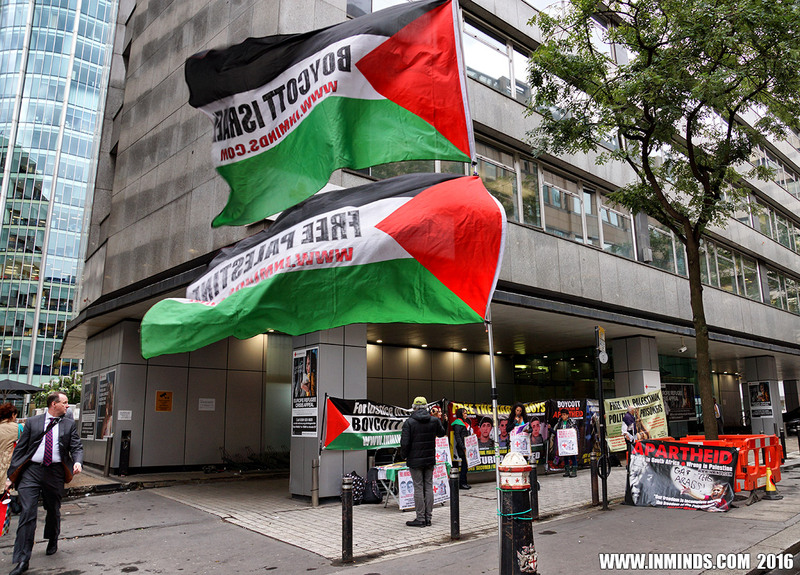 The protest also demanded the immediate and unconditional freedom of the three Palestinian hungers strikers Malik al-Qadi, the brothers Mahmoud al-Balboul and Mohammed al-Balboul and an end to administrative detention. 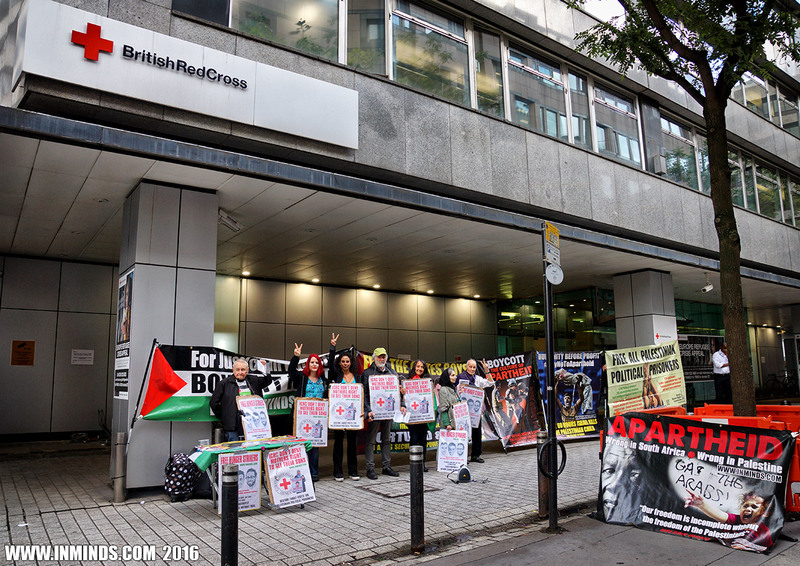 It’s with a very heavy heart that we are here today outside the UK Mission of the International Committee of the Red Cross for the second time in two months to protest at their recent actions in Palestine. The Geneva Conventions gives the International Committee of the Red Cross a mandate to provide humanitarian protection and assistance for victims of armed conflict including prisoners and their families, and to promote international humanitarian law as enshrined in the Geneva Conventions. 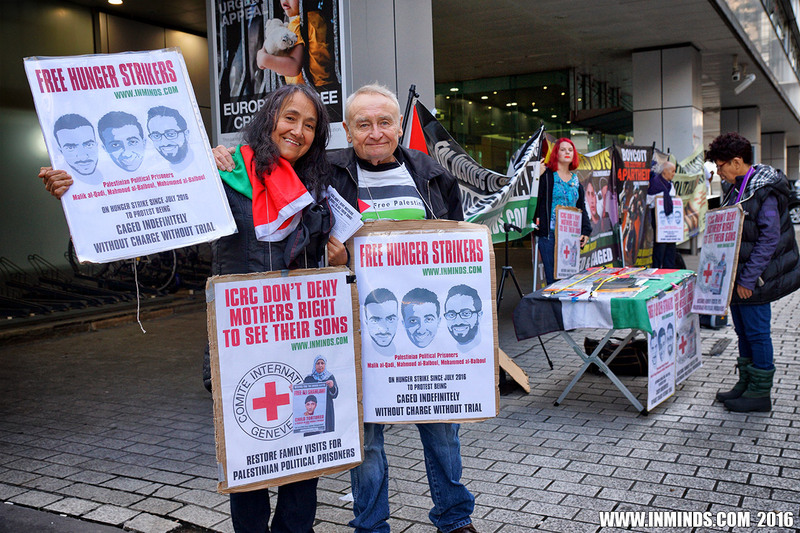 Unfortunately the International Committee of the Red Cross has failed to do this for Palestinian political prisoners and their families. 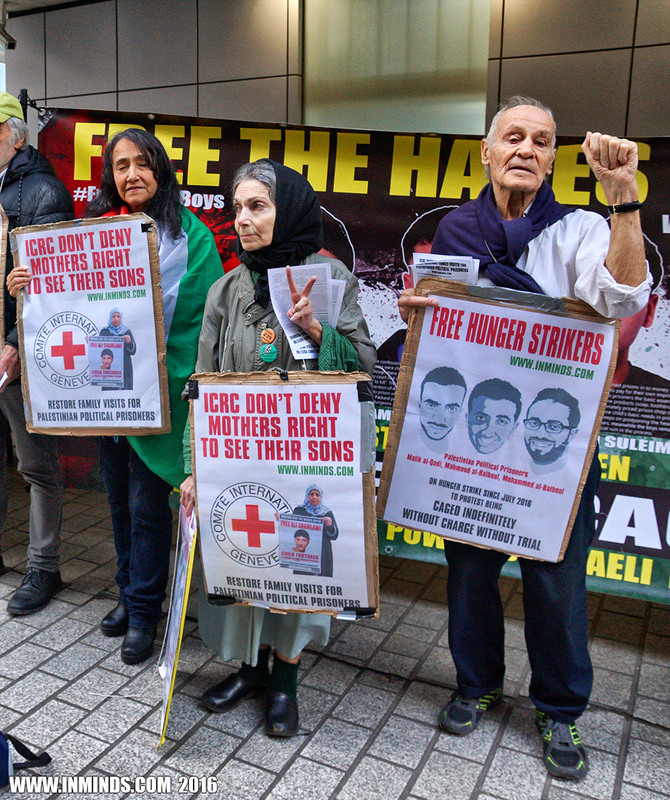 The International Committee for the Red Cross has reduced family visits for Palestinian political prisoners held in Israeli prisons from two to just one visit per month beginning in July 2016. 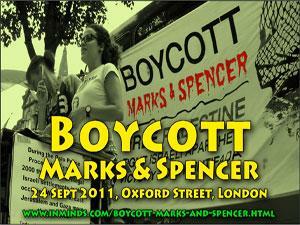 We condemn this shameful decision that has had a catastrophic impact on the lives of Palestinian families. 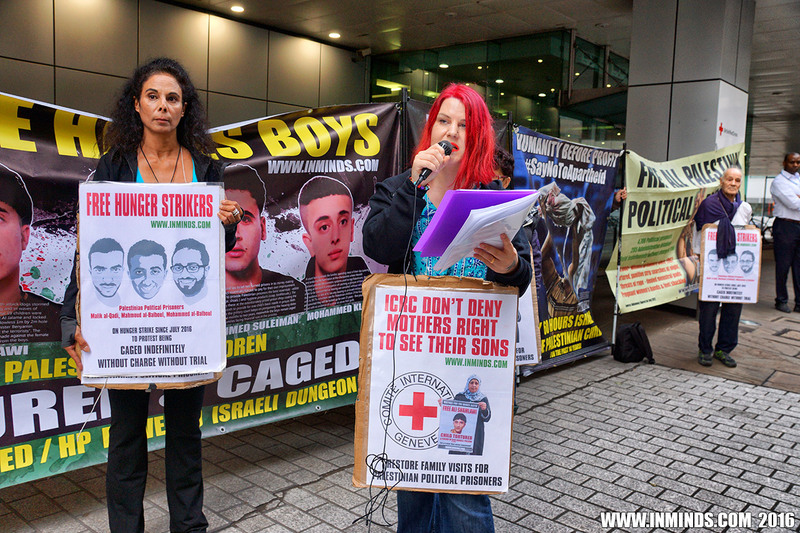 Most families in Palestine have loved ones abducted and caged by the illegal Israeli occupation. 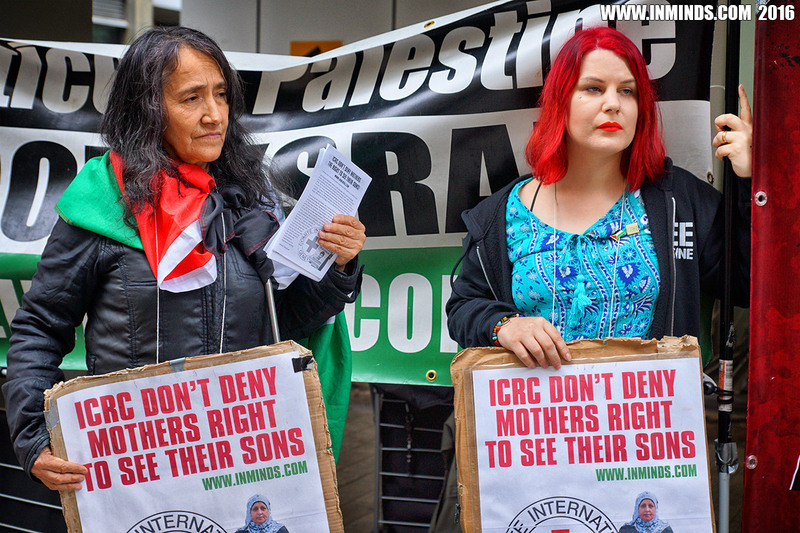 Before our last visit here, we spoke to one mother whose son has been imprisoned by the occupation for 3 years to find out how this callous decision by the International Committee of the Red Cross has impacted her family. 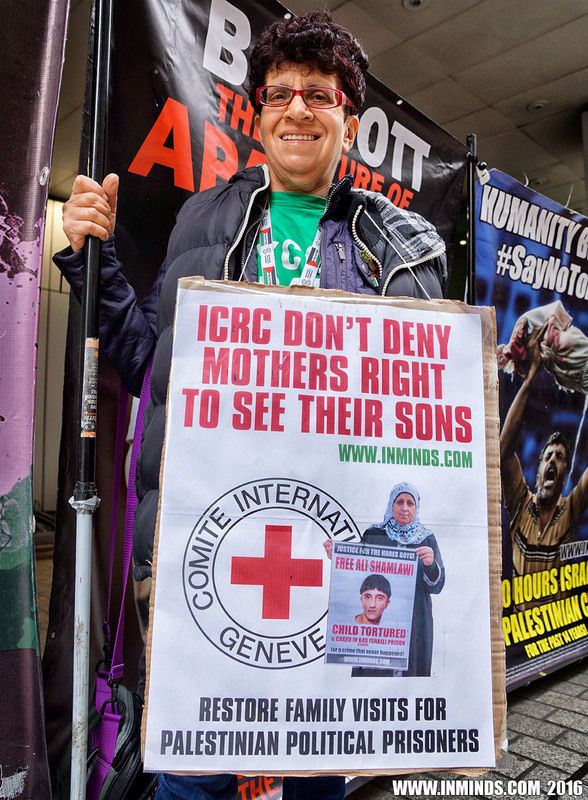 The International Committee of the Red Cross should be working to bring an end to the Israeli obstructions of family visits, and the Israeli violations of the Geneva Conventions. But instead the International Committee of the Red Cross has shockingly announced that from July 2016 it is reducing family visits by 50% for adult male prisoners, from two visits a month to just one visit a month. The right to two visits per month was something Palestinian prisoners fought hard for through many sacrifices including enduring hunger strikes before the Israeli occupation relented to agreeing to two visits a month. Now the International Committee of the Red Cross is denying the prisoners this right. 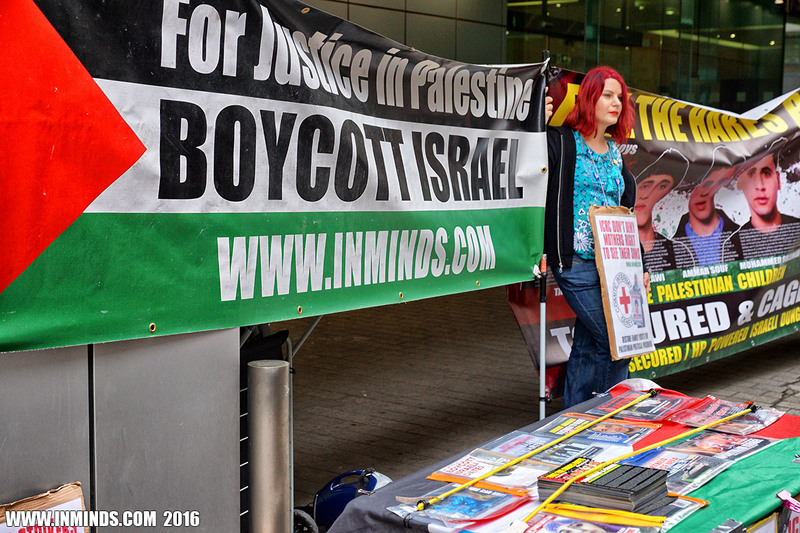 They are acting as an arm of the occupation and are complicit in Israel's denial of family visits to Palestinian political prisoners. I am Neimeh Shamlawi, mother of Ali Shamlawi who is now in Al-Naqab prison. My son has spent more that 3 years in prison and I used to visit him twice monthly, but from July the Red Cross decided to reduce the visits to 50%. 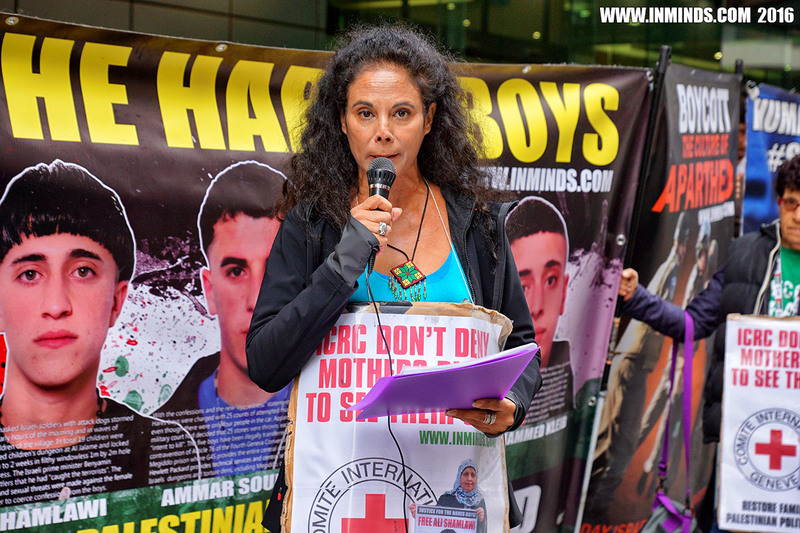 The Israeli government deprived me from my son, and it was a chance to see my son twice a month, but now the Red Cross wants to prevent even this chance. 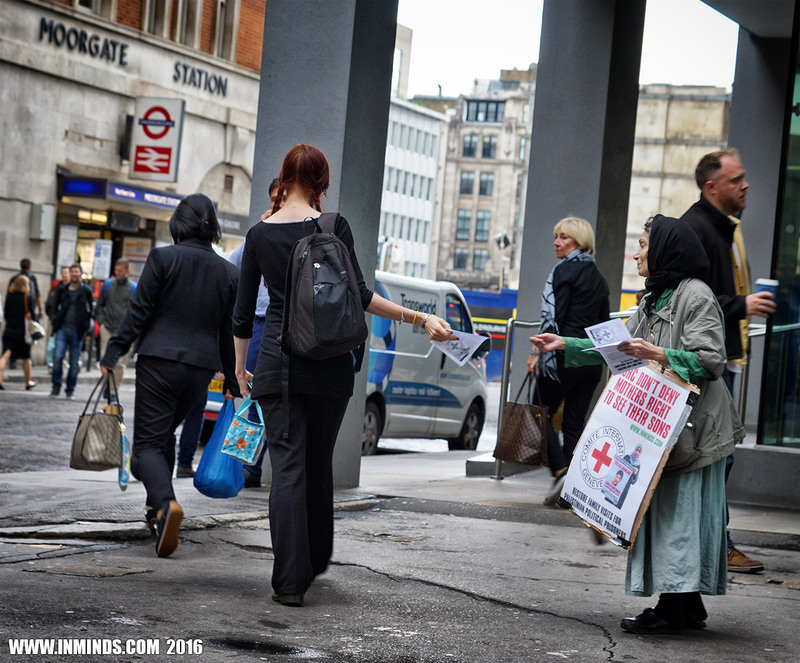 The Red Cross must help us, not help the Israeli occupation in its crimes against us. Without the help of the Red Cross, we will suffer and face many difficulties in trying to visit our children in Israeli prisons. 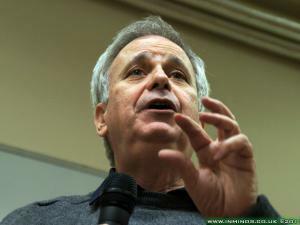 Apart from the exorbitant cost of around $250 to arrange a visit, we also have to contend with the impossibility of negotiating with the Israeli military to achieve such a feat. The decision to cut family visits to once a month will have terrible repercussions. One example is that my daughter was finally given permission to visit her brother whom she misses terribly, the permit is for one visit and is only valid between 10th July to 23rd August. I had visited my son Ali on July 6th, with the next scheduled Red Cross visit being on August 24th. It means that my daughter will not be allowed to see her brother and the permit which was very difficult to get will be wasted. She may not get another permit for at least 6 months. If there was 2 visits in a month (like it was before the Red Cross decision) then she could have visited her brother Ali. 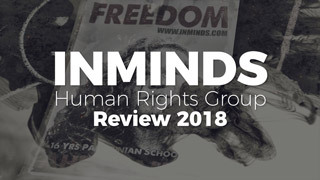 We hope that the Red Cross will reconsider and stop this unfair decision, , and remain the humanitarian organization it is supposed to embody. 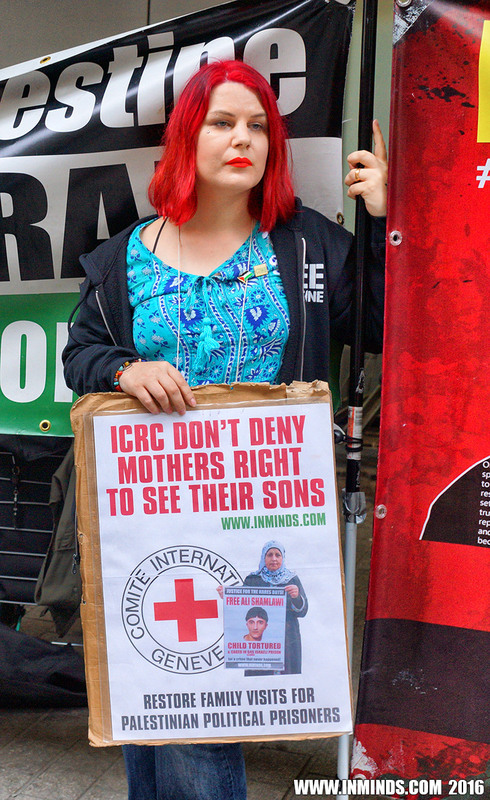 Last month we held a meeting with the deputy head of the UK Mission of the International Committee of the Red Cross explaining that they shouldn’t be penalising mothers like Neimeh Shamlawi and to demand they reinstate the two family visits per month. It is the responsibility of the International Committee of the Red Cross to not put the burden of budget cuts on Palestinian families of prisoners, the most marginalized and vulnerable people, and those who the International Committee of the Red Cross should be serving. We handed a letter outlining our concerns and asked for a written response. In our meeting the International Committee of the Red Cross indicated that they look at this case as a "special case" and will ensure that Neimeh Shamlawi’s daughter will be given a seat on another coach from another town (Nablus) so she can visit her brother Ali within the stipulated period of the permit. Whilst we pointed out that this was not a "special case" but just one of thousands of families that suffer due to International Committee of the Red Cross's decision, but we never-the-less welcomed International Committee of the Red Cross's intercession in this case. 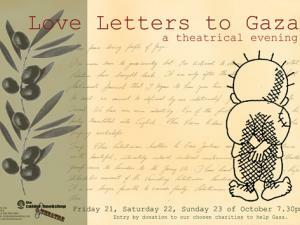 When we didn't receive a reply to our letter we contacted Neimeh Shamlawi last week to find out what happened. Unfortunately Ali's sister was too ill to travel on the 18.5 hour round trip hence Ali's parents, who also had permits to visit Ali, took her place. They travelled to Nablus at 4:30am on 22nd August 2016 to join the International Committee of the Red Cross coach heading for Tulkarm checkpoint in to Israel. In contravention of Article 76 of the Fourth Geneva Convention, Israel locates most of the prisons where Palestinian political prisoners are caged inside Israel. 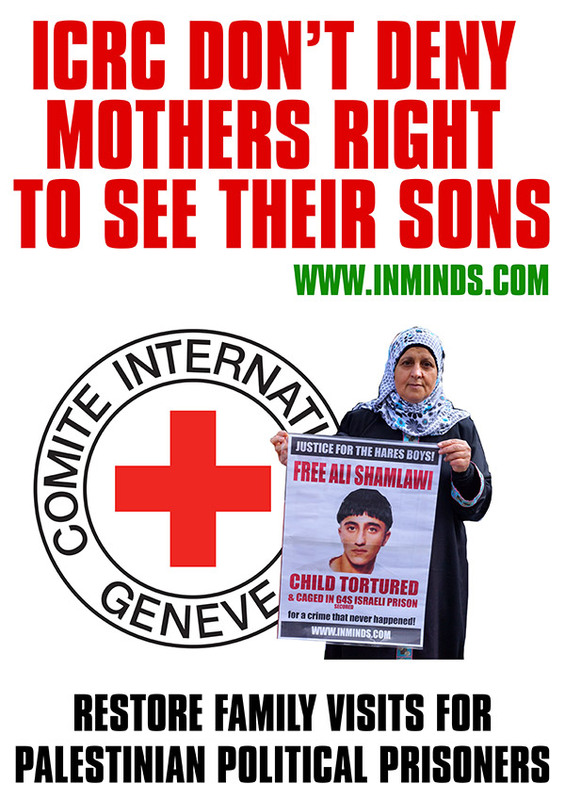 Shockingly at Tulkarm checkpoint, in full sight of the International Committee of the Red Cross, both of Ali's parents were thrown off the coach! The Israeli occupation forces cited "security issues" as the reason for their exclusion with no further explanation given. 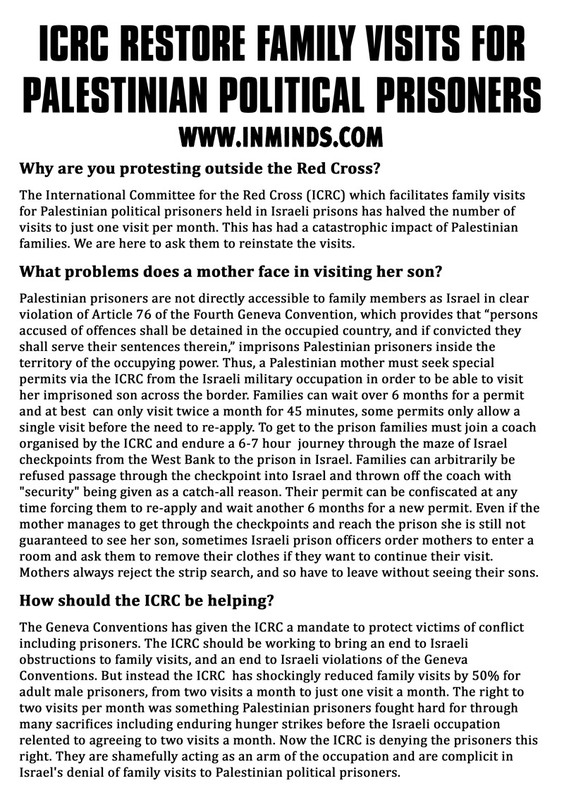 Unbelievably the International Committee of the Red Cross didn't challenge the decision of the illegal occupation forces and demand a genuine legal reason for preventing parents from visiting their child, an act which breaches the prisoners' rights under the Geneva Conventions which the International Committee of the Red Cross was created to champion. Not only were the parents thrown off the coach, the soldiers confiscated their visitation permits so they can no longer visit their son. Neimeh and her husband had yearly permits which allowed them to visit their son twice a month for one year (before the International Committee of the Red Cross cut visits to just once a month). In contrast their daughter was less fortunate as her permit only allowed a single visit before she would have to apply again and could wait over a year for the permit to arrive. Now the Shamlawi family has lost all rights to visit their son. And with the reason being given as "security" there is a strong possibility that their requests for new permits via the International Committee of the Red Cross will be rejected. 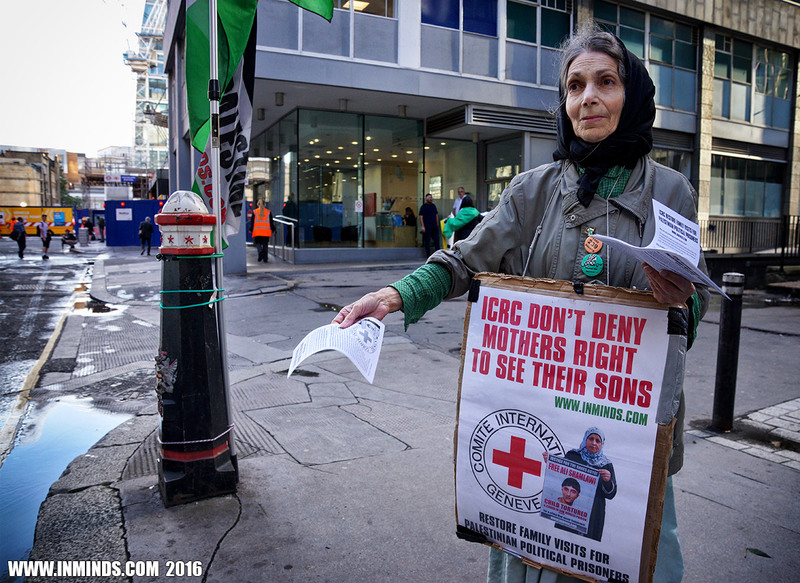 The International Committee of the Red Cross promised to help the Shamlawis visit their son. But now at the first hurdle they seem to have abandoned their 'special case' leaving the family to the mercy of the occupation which has no regard for the Geneva Convention. 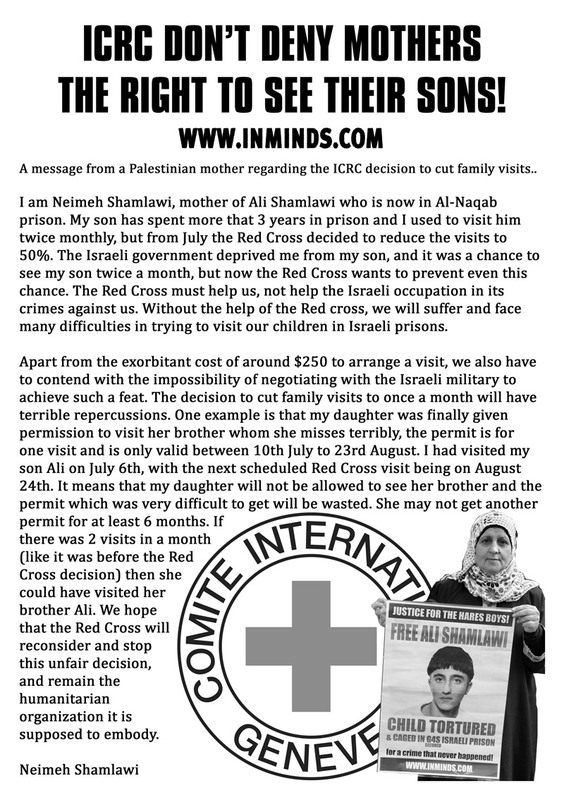 Whilst we are very concerned by the plight of the Shamlawis, it’s important to stress that the Shamlawis are just one example of thousands of Palestinian families suffering due to impediments placed by the Israeli occupation, and now the International Committee of the Red Cross, in preventing them from seeing their sons and daughters who are caged by Israel. 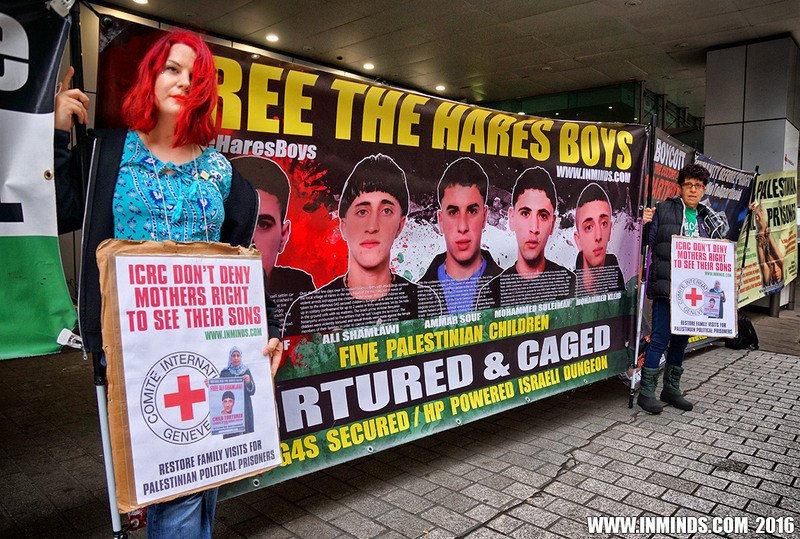 Over a dozen other families were also thrown off the bus along with the Shamlawis at Tulkarm checkpoint including the families of all the Hares Boys - all in front of a silent International Committee of the Red Cross. 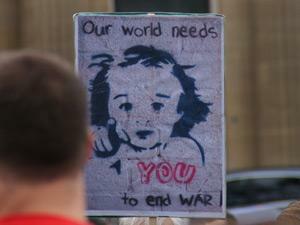 To our knowledge the International Committee of the Red Cross so far hasn't even logged a complaint about it.. Why not? 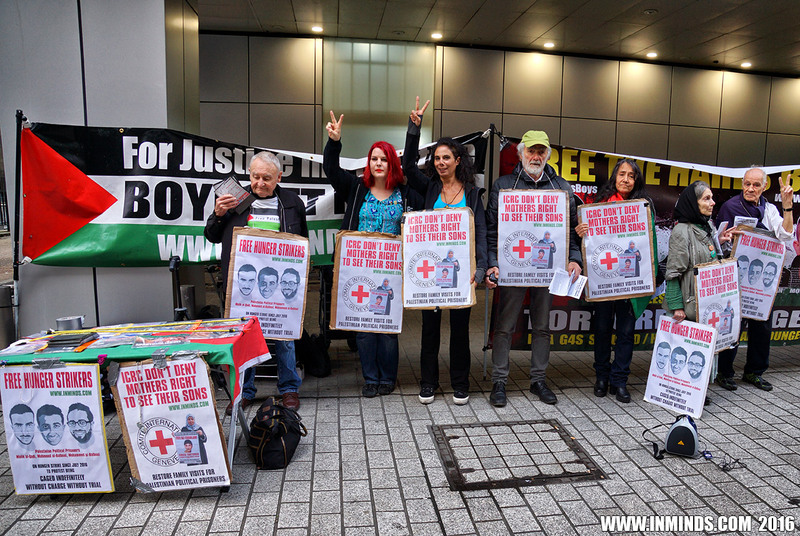 We are here to demand the International Committee of the Red Cross wield the considerable power their unique position provides them to help the families of Palestinian political prisoners. The International Committee of the Red Cross was created on the mandate of ensuring that the Geneva Conventions are upheld. 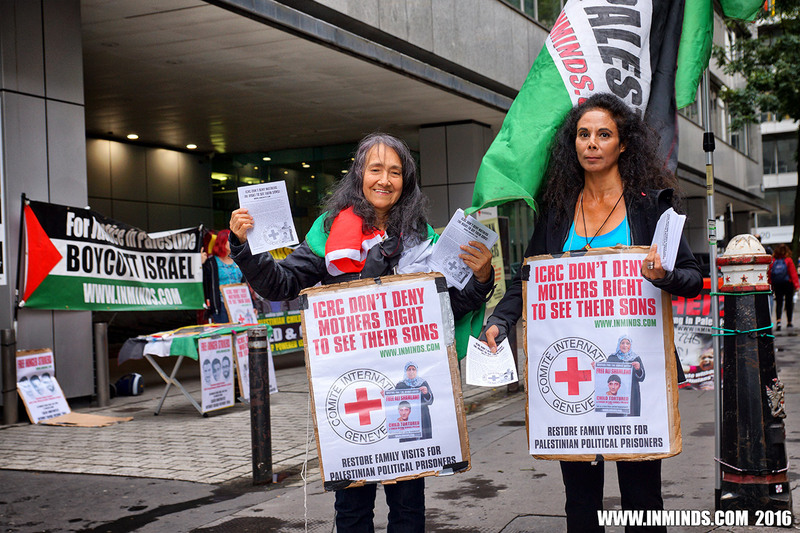 What’s is the point of the International Committee of the Red Cross is they turn a blind eye to Israel's systematic breach of the Geneva Conventions, and then go further and actually help the illegal Israeli occupation shred the Geneva Conventions by denying families the right to visit their loved ones languishing in illegal Israeli prisons? 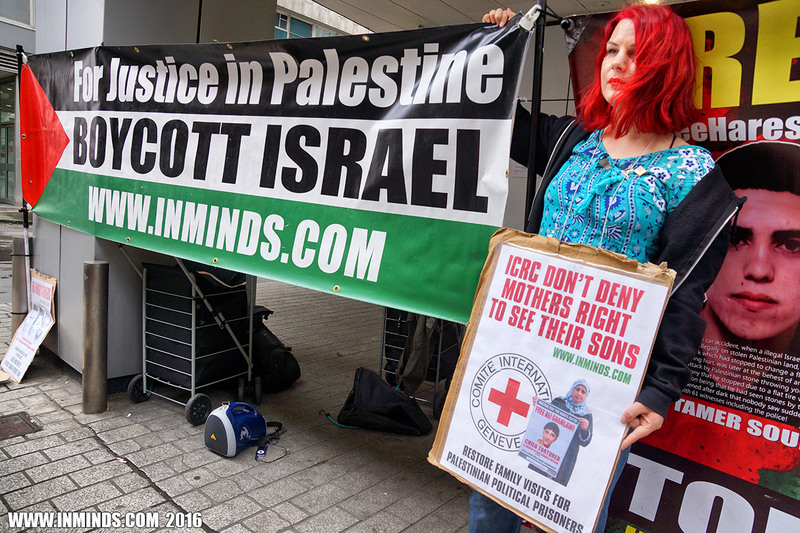 Rather than challenging why Israel is only allowing two visits per month, the International Committee of the Red Cross has cut that to just one visit per month! 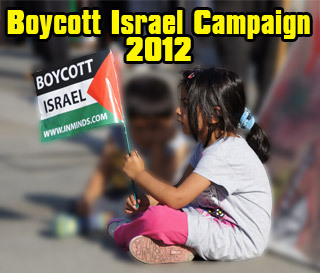 Shame on you International Committee of the Red Cross, Shame on you International Committee of the Red Cross! 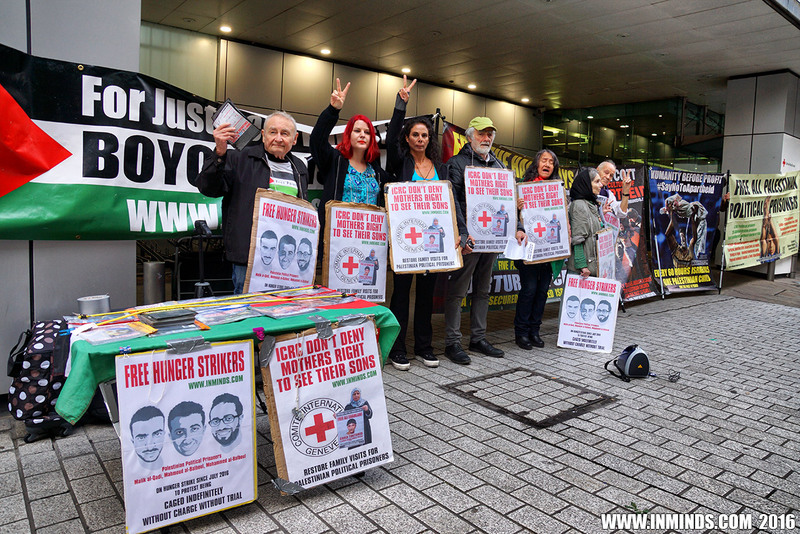 We are also here today to demand the immediate and unconditional freedom for the three Palestinian hunger strikers Malik al-Qadi, the brothers Mahmoud al-Balboul and Mohammed al-Balboul, and an end to administrative detention. 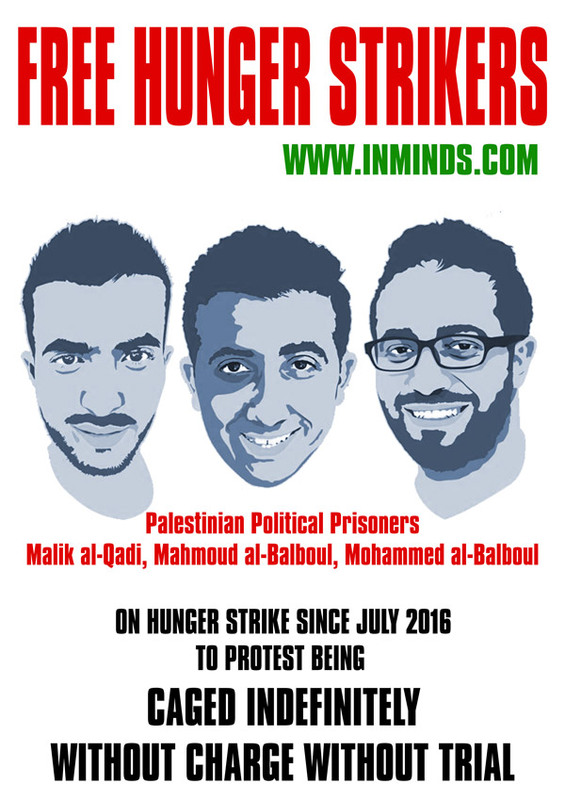 All three have been on hunger strike since July 2016 to protest their imprisonment by Israel without charge or trial under administrative detention. Because there is no charge, they have no way to defend themselves and administrative detention orders can be indefinitely renewed at the behest of the Israeli military occupation with total impunity – some prisoners have been on rolling administrative detention orders for 11 years! 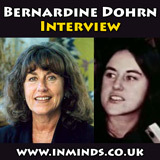 Their only hope was to go on hunger strike to demand their freedom. As their health reaches a critical state after being on hunger strike for over two months, Israel claims their detention has been suspended but their confinement has not ended and they remain imprisoned with their administrative detention still in place, ready to be unsuspended should they end their hunger strike and their health recover. 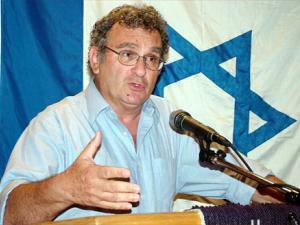 Al-Qadi is already in an induced coma due to his weak state, and all three are at significant risk of forced treatment and forced feeding, especially after the Israeli Supreme Court ruling upholding the “forced-feeding law,” in contravention of the World Medical Association’s complete rejection of the practice as being “tantamount to torture”. 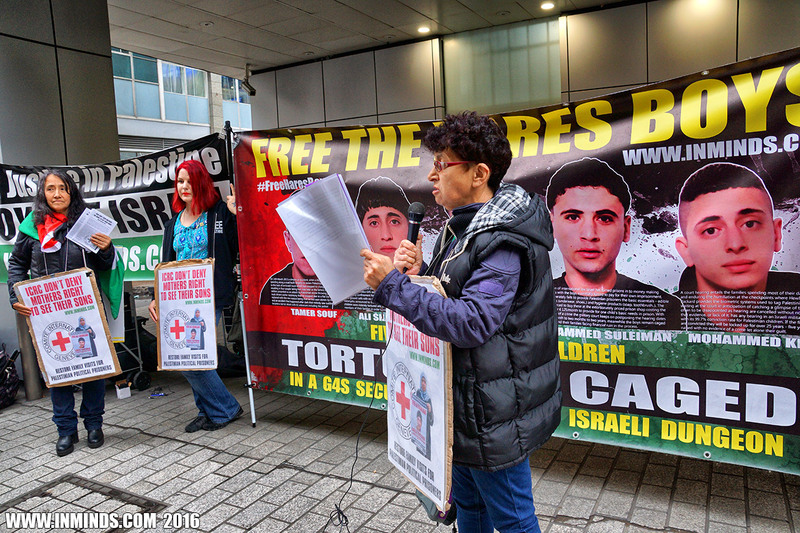 Israeli doctors have previously participated in the torture of Palestinian prisoners like the torturing to death of Arafat Jaradat in 2013. 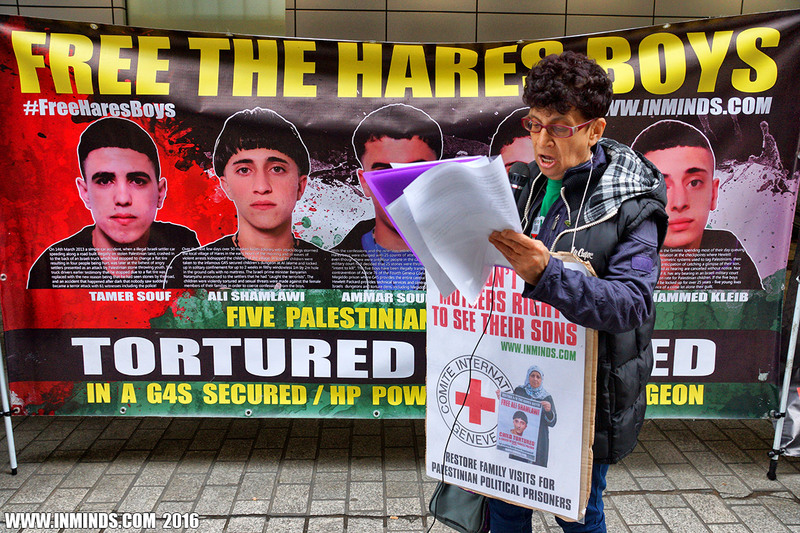 Force feeding is another form of torture that has already resulted in the deaths of five Palestinian political prisoners in the past. 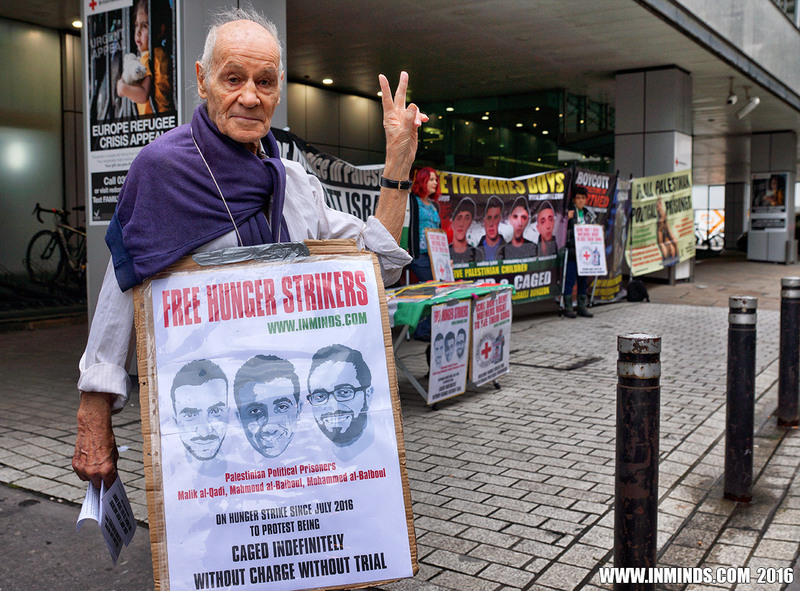 The latest news is that over 50 fellow Palestinian political prisoners have just gone on hunger strike in solidarity with Malik al-Qadi, Mahmoud al-Balboul and Mohammed al-Balboul. Today 750 Palestinians are similarly caged without charge or trial under Israel’s illegal policy of punitive administrative detention, this includes many children. 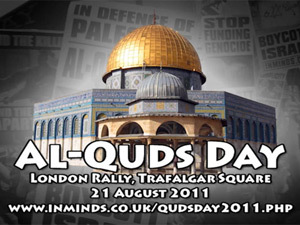 We are here today to demand an end to administrative detention; freedom for Malik al-Qadi, Mahmoud al-Balboul and Mohammed al-Balboul; freedom for the 750 Palestinians caged without charge or trial under administrative detention; and freedom for the 7000 Palestinian political prisoners that are today languishing in Israeli dungeons.